“I got two turntables, and a microphone!” If you have ever heard the song Where It’s At by Beck, then you know that a turntable can make or break your success. Every great DJ needs a turntable to be legit which is why we have put together these reviews of the 15 best DJ turntables of 2019. This post will feature the greatest turntables that are available today. By reading this post you will learn about the intricate specifications that make each item stand out above others. The goal of this review is to help you make a choice on the best turntable for your needs. The #1 turntable we reviewed. An excellent all-rounder. The best value for money turntable we reviewed. Our premium pick turntable on the higher end of the price range. When putting together the ultimate turntable packages for professional or home use, it is imperative to have a turntable that will withstand the test of time, be reliable in various environments, and consistently produce high quality sound for an excellent performance. This model is also designed with professional DJ’s in mind, specifically those who will use this machine in nightclubs or while touring. What makes this item made primarily for DJ’s is that includes Audacity software, is direct drive, high-torque with a multi-pole motor. While this device can be used by any music lover in the comfort of their own home, there are many more features included that will most likely not get to be used if you are not planning to frequent the club. 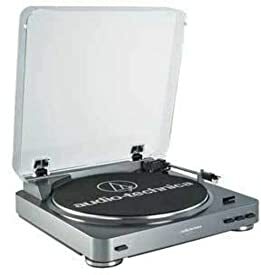 With that said, however, some consumers prefer to use this type of turntable in their home as it is classy, made of glossy-black and silver design that fits into home entertainment systems and includes a built-in switchable phono preamp that can connect to receivers, speakers, and other A/V equipment. There is also a USB output that serves as an easy way to connect to your computer for a seamless LP to digital conversion. Those who want to primarily use this piece of equipment while on tour or in a nightclub, will enjoy the hydraulically-damped lift lever and a tone arm that locks into place. This is helpful as it keeps the arm and cartridge from moving around a great deal while on the road. It is important to note that this item will operate on 120V AC. If you are purchasing this item outside of the United States, be sure to make sure the item is set to function in your region. Rated with consistent outstanding marks by consumers, the Alta Technica AT-LP60 is one of the best DJ turntables under $300 on the market for the money. Most comment on the ease of use, reliability, great quality sound, and durability of the product. Dig out your classic 33-⅓ and 45 RPM records out of the basement, dust them off, and enjoy listening to them on this fully automatic belt-drive turntable. The AT-LP60 has a built-in switchable phono preamp and can be connected to your computer, home stereo, speakers, and anything else that does not have a dedicated turntable input. An integral Audio-Technica Dual Magnet phono cartridge with a replaceable stylus is also included in this purchase. 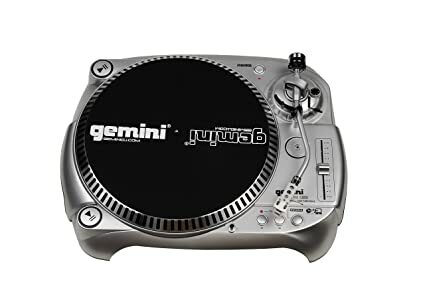 Made of professional aluminum platter, this turntable features two adapter cables which are a dual RCA female to mini-plug male and dual RCA female to mini-plug female, a 45 RPM adapter, and a removable dust cover. Should you have a malfunction or experience a dilemma with this device, Audio Technica’s customer support is known to be outstanding. In addition, you can feel confident in your purchase as a 1 year manufacturer limited end-user warranty is included with this piece of equipment. If you are in the market for an entry level turntable, this is not for you. Unlike the Pyle PTTB1 Professional Belt-Drive Manual Turntable, this item is drive method and does come with a quartz lock pitch control. The Pioneer Pro DJ PLX-1000 is user-friendly but was created with professionals in mind. This item differs a great deal from other items both in cost as well as in the quality and durability of the materials used to make this item. The great quality sound can be contributed to the heavy mass diecast chassis. This is important as it helps to prevent vibrations. In addition, there is an 8mm thick resin bottom and a 9mm thick vibration damping material at the base. Another way that this machine stabilizes while you are playing is with the rubber, insulated tone arm that reduces howling effects. The rubber and springs within the insulator also absorb external vibrations. Some of the features that make this highly rated and a stand out console among professionals in the industry is the high torque, direct drive, stable rotation, and control that is created when playing music. The high torque is important because it allows the turntable to quickly reach 33 ⅓ RPM in just .3 seconds! Many people noted in customer reviews and feedback how convenient this item is compared to others because of the ability to interchange the power and audio cables without incident. It is important to make note that this item weighs just over 30 lbs. Warranty information is not readily available and should be inquired about before investing in this item. 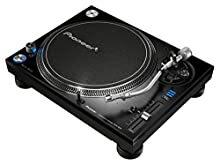 Often times many try to find the best deal possible when looking for a cheap DJ turntable yet end up frustrated and highly disappointed after completing their purchase. Lack of research on products, lack of knowledge about product features and functionality, and the failure to consider investing more money into a piece of equipment that will last longer and feature a great number of specifications. The Audio-Technica AT-LP120-USB is a professional stereo turntable with a high-torque drive motor for a quick start-up. In addition, a USB output allows for you to connect to your computer. You do not have to worry about computer compatibility as this model works with Mac and PC computers. Consider using the Audacity software to digitize your records. Covered by a 1 year manufacturer limited end-user warranty, you can also rest assured knowing that you can also contact great customer support through Audio Technica. 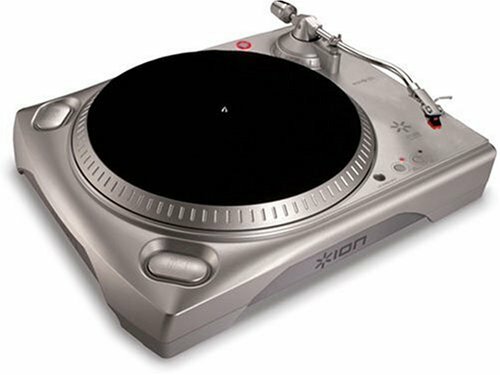 There are currently 3 primary types of turntables on the market. Direct drive turntables, belt-driven turntables, and the idler-wheel type. 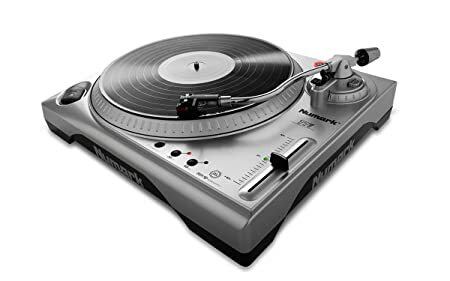 It is important to know what kind of turntable you desire as each type is based on the coupling that is used between the platter and the motor. Be sure to research the difference between these to decide what is best for your needs. 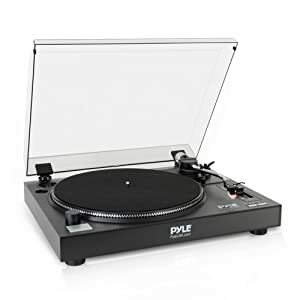 The Pyle PLTTB1 is a professional turntable with a belt-drive that is consistent, reliable, and great for listening to vinyl in the comfort of your own home. This product provides the ability to listen at 33 or 45 RPM speeds. It also comes with a dust cover, counterweight, and pitch adjustment options. 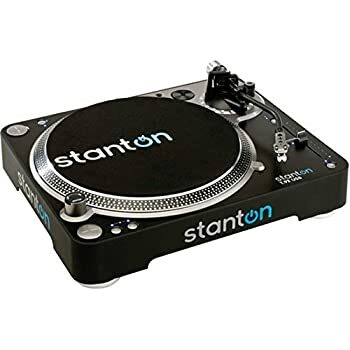 Other features include strobe light illumination, weighted tone arm, start and stop button, as well as a cartridge and stylus that comes standard with this item. The manufacturer claims that this is the best belt-driven turntable on the market. After researching consumer reviews, forums, and feedback on a variety of sites, most consumers rave about this item as it is easy to use and produces good sound. The only complaint that has consistently come up as that parts of the item are made of plastic making it very lightweight but takes away from the professionalism-feel. Additionally, the pitch control is not “quartz lock” like other high-end turntables. It is important to note however that this device is priced well under $100 and performs similarly to those that cost much more. If this is high on your list, you may want to also make note that this machine comes with a 1 year manufacturer warranty. Professional and novices both agree that this turntable is wonderful for beginners. 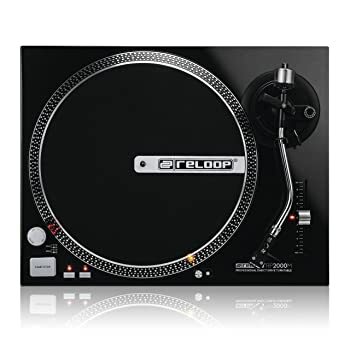 We will discuss many devices that are rated as one of the best DJ turntables for beginners but this one is full of features that most others in this price point lack. 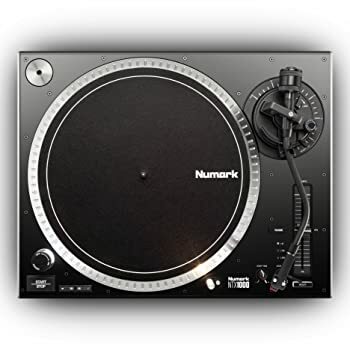 The Numark TTUSB provides plug and play, USB compatible turntable that allows you to digitize your vinyl collection to your PC or Mac computer. All the cables that will need are included in your purchase. If you are looking to export music to other formats, archive records, or transfer to cassette tapes, the TTUSB includes a ⅛ -inch stereo mini jack connector that will allow you complete this task. With the ability to export songs to digital formats, you can also make the file into a WAV or MP3 and perhaps make a few dollars on it by being the first in our area with outstanding quality men’s shaving products. Additional software, such as the Audio Recording program are available at your favorite local vinyl retailer. One of the best DJ turntables online today, the Ion TTUSB is perfect for those who are looking to transfer music from their vinyl record collection to their computer. Why would anyone want to do that you ask? Having your music on your computer allows you to listen to your music, record it to a CD, or even upload it to your favorite MP3 player. It is important to note that in order to upload it to your MP3 player, you must use iTunes. In addition to being able to play music on your computer, you can also listen to your records through your home stereo by simply using the switchable-level output on this TT. There is no preamp required so you do not have to stress if you do not have a phono input. Ion includes their exclusive software with your purchase making the transfer of files relatively easy to do. The EZ Vinyl Converter is the best and easiest way to record and transfer vinyl directly to your iTunes library. This console is class compliant and does not require the usage of drivers. It is easy to hook up and use. It is also important to note that you can use this TT with a Mac computer. 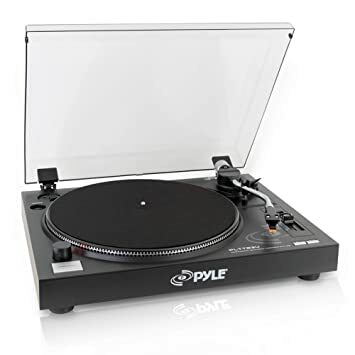 Extremely lightweight as it is made of durable plastic, this Pyle model PLTTB3U is an outstanding turntable for DJing. Many entry level DJ’s have commented through reviews, consumer reports, and on various forums that this device is the perfect entry level TT. Great value for the money, you will not only receive a quality TT with belt drive and USB, but it also includes the Audacity digital recording software, headshell, dust cover, and 45 adapter. Highly regarded by most, the only consistent chatter that has been mentioned as an improvement for this device is the fact that you may have to make minor adjustments to the pitch control from time to time. It is also important to note that although one of the features is the removable stroboscope light, the light is actually not included in the accessories kit and will need to be purchased separately. As with all Pyle products, they stand behind their equipment and offer a 1 year manufacturer warranty. Another quality Stanton product, the T92USB is well known its versatility and the ability to not only transfer music from vinyl records to your PC or Mac but also edit music files with the included software. To make a truly integrated system, be sure to plug into a DJ controller for better functionality. This TT is professional quality that features a high-torque direct-drive motor like many of the other Stanton models. This one has a sturdier construction allowing for great durability. It is important to note that this system is not one to transport from venue to venue but should be kept in a set location. This model includes audiophile-quality Stanton 300.v3 Cartridge already pre-mounted to the headshell. Other accessories include a slip mat, USB cable, dust cover, and RCA cable. Overall, consumers love this item and rave about the ease of use within the home and the convenience of using the USB cable to hook up to a computer. The sound quality is superb as is the durability of the TT and the working parts. Although advertised that it could be used by a professional, the reviews tend to say otherwise which is why this received an intermediate rating. While many beginner level DJ’s mentioned the ease of use and the great features, those who are highly involved in the craft, would not find the features on this model to be sufficient for their gigs. 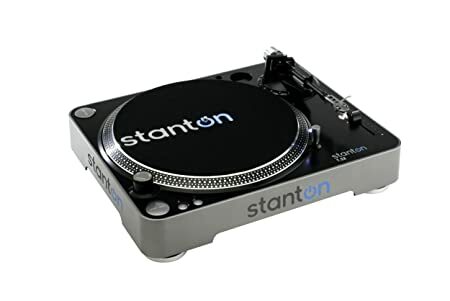 Another wonderful item by Stanton, this model is highly regarded by consumers to be the best turntable for scratching. Some of the highly coveted features include but are not limited to the ability to utilize two playback speeds of 33 or 45 RPMs, a straight tone arm allows for improved tracking during scratching, and the two start/stop switches allow for mix or battle orientation. We rated this item as an entry level device as it is a great TT for those who want to learn without being overwhelmed by too many professional options. There are just enough sophisticated features to intrigue one to continue to learn the trade without causing an abundance of frustration in the process. A quality, reliable device that will not let you down and will provide daily satisfaction while mixing your favorite tunes. Backed by great Stanton customer service and the ability to customize your console with the style flip image uploader, you will be on your way to stardom in a flash. With this TT, you will not have to worry about not being able to plug DJ headphones in. You will want to play around with this unit before setting out for your next gig. There are so many components to it that you will be in awe. Add Pioneer’s rekordbox DVS, which is a compatible DJ mixer, for full functionality in playing your digital files. The ease of recording is outstanding as it is easy to connect to a computer by utilizing the USB output. This item weighs just under 30lbs and is best used in one place. Although heavy and made of great quality materials, It is not advised to be transported around on a frequent basis. Boasting smooth DJ play with mixing and scratching abilities, the PLX-500 is available in black or white. To customize the look of the TT further, you can add your favorite vinyl album to your display by simply using the sleeve stand in the dust cover. Consumers are raving that this is a great value for the price. 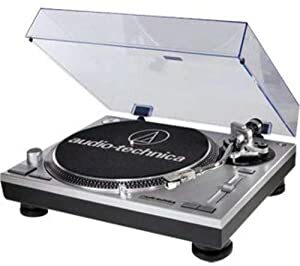 A professional TT that is durable and is easy to use, you can rest assured that you will be enjoying your vinyl records for many more years to come. A fantastic DJ mixer with a quartz driven, direct drive motor means that this is guaranteed to impress even the most seasoned professionals. The importance of the high-torque direct driven motor is that the torque allows for greater and quicker power to the TT. Additionally, this model offers exact-to-second technology! Some of the highlights to this machine include but are not limited to an electronic motor brake, has great shock absorbency, and is offered in 2 speed manual. Other notable things to consider with this model is that you can connect to a remote starter or a beat counter with the purchase of some additional tools. While we have discussed many great professional TT’s in this guide, the Reloop is unique in that it is made by people who have only been in the business for 2 decades yet they are passionate and proud of their work as if they just opened up their shop yesterday. On their website, you can find support in more ways that most. Download a guide, inquire about a spare part, join a forum, or post a question. Reloop has not only built superb products but also a community of enthusiasts just like yourself who are interested in helping one another get back to playing as fast as possible. This model is made in a unique and classy looking design. The purpose of this design was so that the consumer could play both at home with family and friends as well as all night long at the club. This belt driven turntable comes complete with USB connectivity abilities, a built in ABS base with heavy, adjustable rubber feet. This feature is important for those who do not appreciate external vibration feedback in their playing. The simple motor on/off switch with LED light allows for a prompt response when starting the platter and touching the speed buttons. This device works with both the 33 and 45 RPM speeds. If you want to play a 78, simply press the 33 and 45 RPM speeds at the same time. Another great feature that many love is that you can connect this TT to your PC or Mac by simply using a USB cord. This is a great feature because it allows for the consumer to transfer their vinyl music into a digital format at a generous sampling rate of 44.1 kHz and 16-bit depth. If you have both vinyl and digital in your collection, the Gemini is one to highly consider as a future purchase. When designing the ST150 model Stanton wanted to create it with previous models in mind. While engineering this DJ turntable they went back to the basics by producing a product that was simple while providing DJs with everything they needed from a turntable. The Stanton ST150 is a turntable with direct drive rather than belt drive and includes a motor torque of up to nearly 4.5 kg. A feature that simplifies the job of the DJ is the anti-skate S-curved tone arm which is also easily adjustable if you need to modify the height at any point during a set. 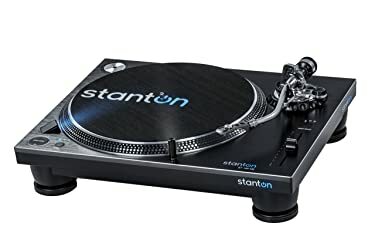 Putting aside the technical features of this Stanton DJ turntable, the product only weighs around 22.5 lbs (10.2 kg) which along with its reasonable size makes it easy to set up as well as transporting it between sets or gigs. Numark pride themselves on a brand that pays attention to what their customer needs from a DJ turntable and with the NTX1000 they have thought about the continuous need and want for vinyl at DJ sets. With that said, Numark have not compromised with everything else DJ needs and have made sure that this model has all the features required. The start-up torque on the Numark NTX1000 is 4 kg and also included is a S-shaped tonearm that has the otpion to change the height if needed either during or between sets. One key feature of the NTX1000 is the 2-speed design. It has different speed modes for any type of vinyl that the performer may be using. To make sure there are no problems using different vinyl record types, Numark also included a 45 RPM adaptor to the turntable. One common mistake for DJ turntable brands is to build a turntable which has all the features but suffers in being too heavy and big as a result. The NTX1000 only weights 20.9 lbs (9.48 kg) and is not too big in size to cause problems transporting the product or fitting in between the other equipment you have set up. One popular piece of equipment that all DJ need as well as turntables is speakers for their gig. Why not also invest in some DJ speakers today! It was important to us to pick not only the highest rated machines, but also ones that are known to be durable, made of good quality materials, and perform at an outstanding level. We did not choose products based on price or highest number of 5 star reviews. We looked at all of the devices we selected as finalists and compared and contrasted to competitors. 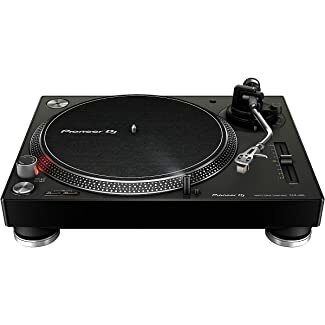 The top 15 DJ turntables that rose to the top have done so because they perform consistently as stated by the manufacturer in the item description, offer great features that will continue to work after consistent usage, and received consistent praise by consumers, marketers, manufacturers, and critics over an extended period of time. 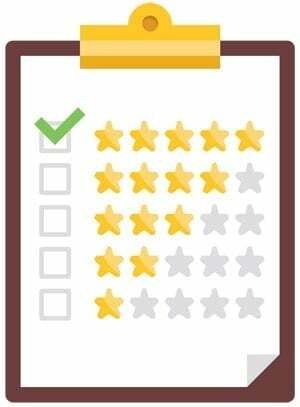 From time to time there would be a less than stellar review, but our team looked into the issue and found that if there was a concern, it was usually more the disgruntled customer than the actual product. You will see in the description with some products, the manufacturer has chosen to offer a warranty. Although this is something to consider in making a purchase, it is also just as important for a manufacturer to have great customer service. Otherwise, if you are unable to reach customer service, the warranty is null and void anyhow. The point is that even if a particular product you have found to be a favorite does not offer a warranty if they provide outstanding customer service, you should feel good about making the purchase. You can be confident in the advice put forth in this guide. We have taken a great deal of time to research items in varying price points so that you can make the best decision for you. It is our hope that we can help you make a great investment in a turntable that will be with you for years to come. There are several things to consider when investing in a turntable. This part of the guide will outline the top things to think about when making your choice. Budget: As you saw in this guide, DJ turntables are available in a wide variety of price ranges, level of ability, and functionality. If you are just starting out, you can purchase a vintage or used unit for cheap or you can spend roughly around the same amount and purchase a brand new semi-professional device that will be your companion in learning how to play vinyl music. Regardless of how much you are willing to invest in your purchase, be sure to do your research first. Belt drive vs. Direct drive: Direct drive motors are typically preferred by DJ’s as the platter can be rotated backward by hand without damaging the TT. This allows the DJ to create interesting effects. The belt drive is typically a preference of those who enjoy audiophiles. Manual vs. Automatic: A manual requires more involvement by the user than an automatic player. The manual requires the user to lift the tonearm and place it on the spinning record whereas the automatic player requires the user to hit a button. The automatic turntable is best suited for those who are new to the craft. Do you need a built in phono preamp? To increase sound quality and the level of sound output, it is important to check if you have a phono input jack or if it already comes with a preinstalled preamp. Consider the cartridge that is included with the device: The cartridge is important because it connects to the tonearm and holds the stylus. Worn cartridges can reduce sound quality or even cause damage to your vinyl records. It may be wise to do some research on the cartridge that is included with the TT to ensure that it is going to function the way you want it to. Hopefully, this guide has demonstrated a wide variety of TT’s to choose from at varying price points, functionality, and user ability. The items mentioned in this guide have been researched a great deal by our team through manufacturer descriptions, reviews, feedback, and on community forums. You can be confident in your purchase if you choose one from our list as it made the top 15 out of hundreds of possible options that are available on the market today.